Pick up any Dave Edmunds album, and you’re likely to take a trip through a variety of classic rock, rockabilly, blues and country tunes, all rendered in a loving and distinctive style by the Welsh guitar great. Interestingly, though, Edmunds is all too often remembered these days for his work with ELO’s Jeff Lynne during the mid-’80s. Lynne put his signature sound on two of Edmunds’ albums from that time — “Information” in 1983 and “Riff Raff” in 1984. 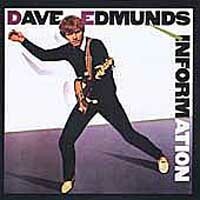 I’m sitting here listening to Side 1 of “Information.” Lynne produced two cuts, and it was the first time anyone else had produced even part of an album by Edmunds. But once you get past the first cut, it sounds like a fairly typical Edmunds album. Side 1 starts with “Slipping Away,” which was written and produced by Lynne (and was Edmunds’ biggest U.S. hit since “I Hear You Knocking” in 1970, reaching No. 39 in the charts). After that, Edmunds delivers a faithfully upbeat cover of NRBQ’s “I Want You Bad,” then channels Peter Wolf on a cover of “Wait,” one of the earliest originals by the J. Geils Band. Listen to Side 1 for yourself. “Slipping Away” … “Slipping Away” … yeah, you know that one. Here’s why. Here’s the video from 1983.